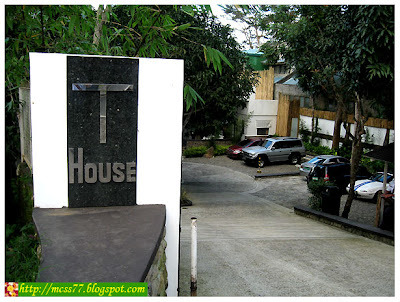 I chose T-HOUSE for my hubby's post-birthday celebration after seeing rave reviews on other forums. As soon as we arrived, we were warmly welcomed with a refreshing drink. 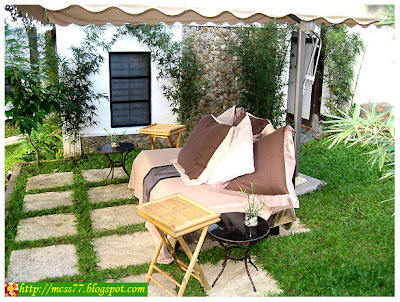 After checking in, one of the staffs led us to our Luxe Garden Suite (Earth), Php 6,325.00 per night. 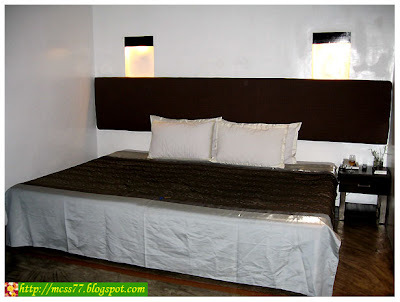 Our room had air-conditioned with hot and cold shower, 24" flat screen cable TV and WIFI access. Ameneties such as shampoo and soap, bath and hand towels were provided and it comes with a complimentary breakfast for two the following morning. Upon entering our room, I was in 7th heaven when I saw our gigantic bed (I thought). Soon I grabbed and tucked into the beddings, but my delight was soon deflated when I noticed that it was just two beds combined. Quite frankly, although I'm a fan of modern & chic design, I also admire simplicity but I wasn't particulary impressed with the room; bathroom fixtures and fittings were ordinary and the flushing system of the water closet wasn't strong enough (being a former manager myself and hubby currently working in a plumbing bathroom fixtures industry enhances our judgment capabilities). I was also disappointed that there was no bathtub and to think it was the most expensive room. And much to our dismay, about late at night we were unable to receive over-the-air cable TV signals until around 10:00 the next morning. Although the room is decorated in a Zen style, it's in need of a little touch-up paint and decor re-invigoration. The place doesn't offer great views of the Taal Lake and city. However, the room was clean and EXTREMELY SPACIOUS which was very comfortable for us. 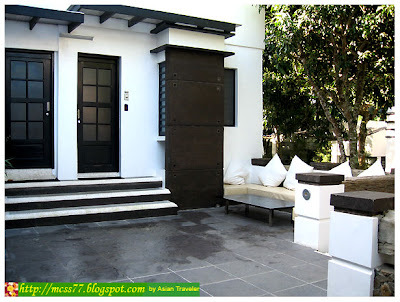 And my favorite place was the large canopy sofa bed with lots of pillows, just right outside at the back door to our room. It provides a perfect setting, especially at night when we took a complimentary Good night Tea, while hearing the sound of fountains that brings peace and tranquility everywhere, gazing at trees and feeling the cold windy atmosphere. T-House has Zen-inspired rooms and landscapes with 15-room bed and breakfast. Each room has different personality. Divided into three clusters-Fire, Earth and Water - each has its "Yin" and "Yang". For ultimate relaxation, they also offer a full body massage, aromatherapy massage, foot spa and natural facial. Advance booking is required at the front desk. Generally, our stay was just okay. I would say this place is not for everyone but might be ideal for some! I describe this hotel as a boutique hotel wannabe. Unprofessional stuff, room with lots of ants and no decent closet. At first glance, the place look nice but if you look closer, the interior of the rooms look unfinished. It feels like it was done in a rush. 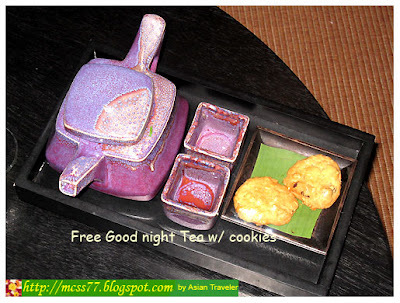 Ample parking, nice evening tea...but other than that, T House was really quite disappointing. Recommendable? No. Will go back again? Never!